The pear shape is one of my favorite cuts in diamonds, colored stones, and moissanite. Growing up, my grandmother had the most beautiful green emerald three stone ring with white pear shape diamonds on the sides. It was through this ring that I fell in love with pear shapes as accent diamonds in a three stone ring setting. Here at deBebians, we offer a variety of three stone ring settings, and among my favorites are the ones with pear shape accent side diamonds. This three stone ring is shown with an oval center and two accenting pear shape diamonds. 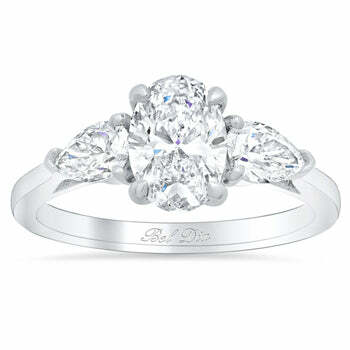 In this ring, the pear shapes weigh 0.60cttw and are G color and VS clarity. Even though this ring is shown with an oval brilliant center, we can manufacture this setting with any shape center stone. This classic three stone ring is shown with a round brilliant in the center with two accenting pear shape diamonds. In this particular ring setting, the pears weigh 0.50cttw and both are G color and VS clarity. 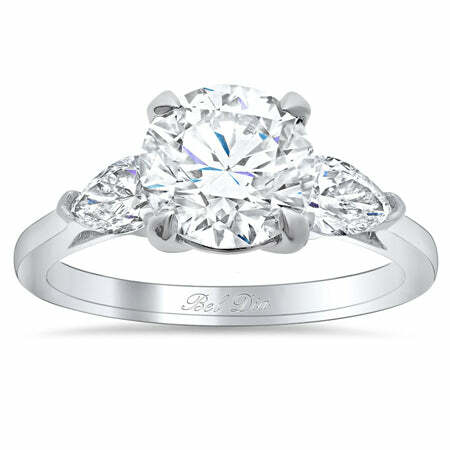 Again, with this ring setting, we can set any shape center diamond or moissanite that you prefer. probably already know that I love the combination of white diamonds and blue sapphires. In this three stone pear and sapphire oval ring, the pear shape accent diamonds weigh 0.60cttw. 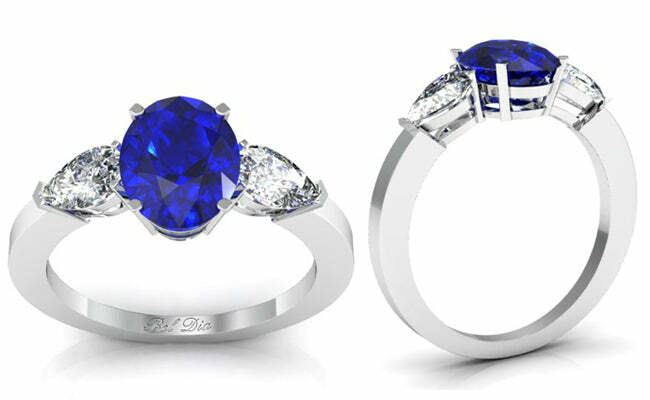 With this ring, you can choose the center oval sapphire that you prefer. We offer this ring with a 1.00ct, 2.00ct or 3.00ct center blue sapphire. Such a gorgeous ring! Three stone rings are very classic and often times you see trapezoids, tapered baguettes or trillions used as the side stones. Remember to consider pear shape diamonds as side stones in a three stone ring. To me, there is just something about the shape of a pear that makes it the perfect side stone!